We woke up to a beautiful day on Saturday, August 26, ready to kick off 31 hours of learning, fun, and community spirit! 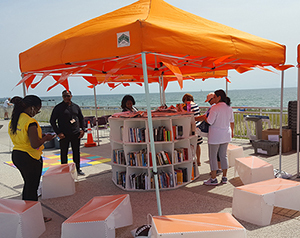 More than 6,000 people passed through the doors of Queens Library at Peninsula over the weekend, with the Rockaways proving a popular location in the late days of summer. Hundreds more customers and passersby took advantage of the pop-up library on the boardwalk, the mobile library, wellness activities on the beach, and various events outside on the library plaza, including a resource fair with great community partners, movie screenings, and live music. On Saturday night, the Steel Impressions Band wowed the crowd with calypso music, followed by an open-air double feature of two of our favorite beach-themed movies: Finding Nemo and Jaws. Later, the library hosted late-night board games and karaoke, keeping the lights on right through the night. Sunday morning kicked off with a yoga class at sunrise on Rockaway beach, leading into guided meditation. 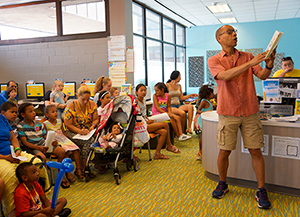 Arts and crafts programs, face painting, back-to-school activities, and a mermaid storytime resulted in lots of happy families! 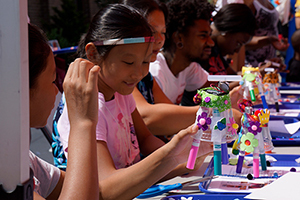 Teens were able to try their hand at building their own skateboards, and a special robotics “wiggle bots” workshop hosted by Bloomberg volunteers stole the show. The day ended with another musical performance, this time by the Asen Doykin Trio, who played bossanova, Latin, swing jazz, and classic rhythm and blues. Library staffers were on hand to answer questions and provide library services for all visitors, many of whom were simply glad to be able to use the computers, read, or borrow materials at all hours. The Summer Festival was 31 hours of conversation, celebration, and clear blue skies. We had a fantastic time!